These are birds of high tropical mountains, and are rare breeders in the US. 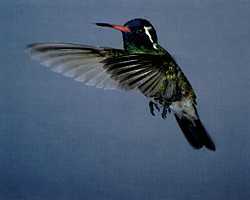 Average weight: male 3.6 g, female 3.2 g.
Adult male: Emerald green back and breast, purple crown, iridescent blue-green chin, prominent white ear stripe, red bill with black tip. 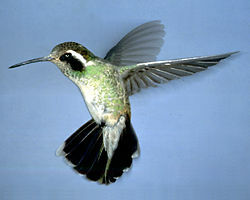 Adult female: Green back and crown, white breast and sides with green streaks, prominent white ear stripe, red bill with black tip. Observed in Arizona, Florida, Michigan, Mississippi, New Mexico, and Texas. Winters in mountains of Mexico.